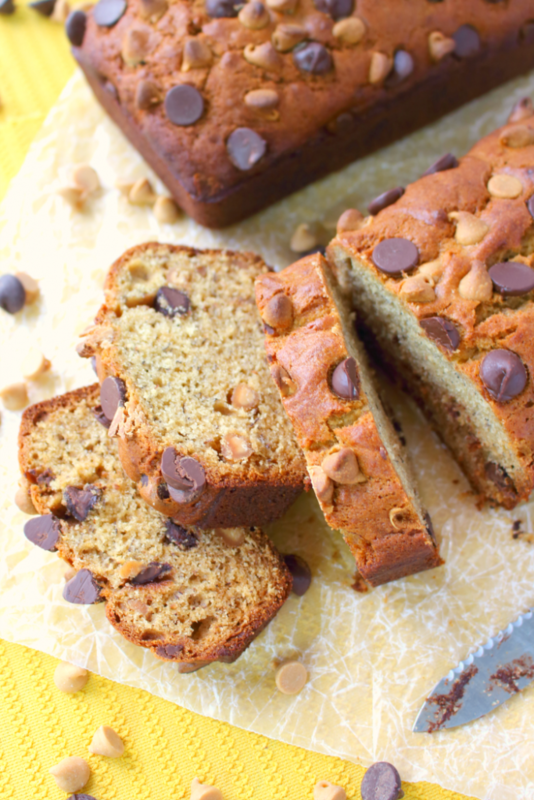 Your new favorite banana bread recipe is here! 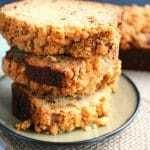 This flavorful, delicious peanut butter banana bread is loaded with chocolate chips, creamy peanut butter, and peanut butter chips, making an amazing breakfast treat or afternoon snack. 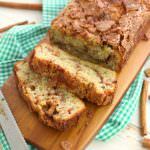 Starbucks banana loaf has got nothin’ on this! 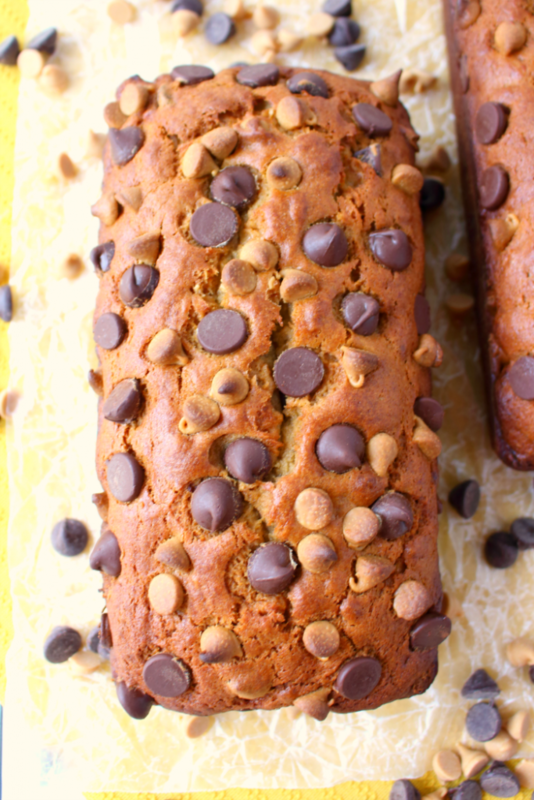 If you love the combination of chocolate, peanut butter and bananas, you’re gonna go “bananas” for this incredible Chocolate Chip Peanut Butter Banana Bread. Up until recently I had never added peanut butter to my banana bread. Yeah, I’ve enjoyed chocolate chips in my Purple Ribbon Banana Bread recipe, but I had really never thought to add that additional flavor competent of peanut butter into the mix. I had no idea what I was missing! 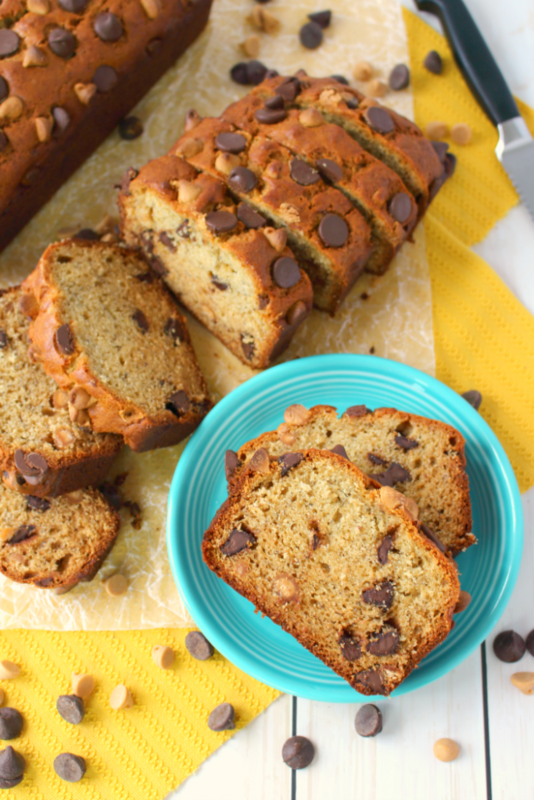 If you love a good chocolate chip banana bread recipe, then this is definitely for you! 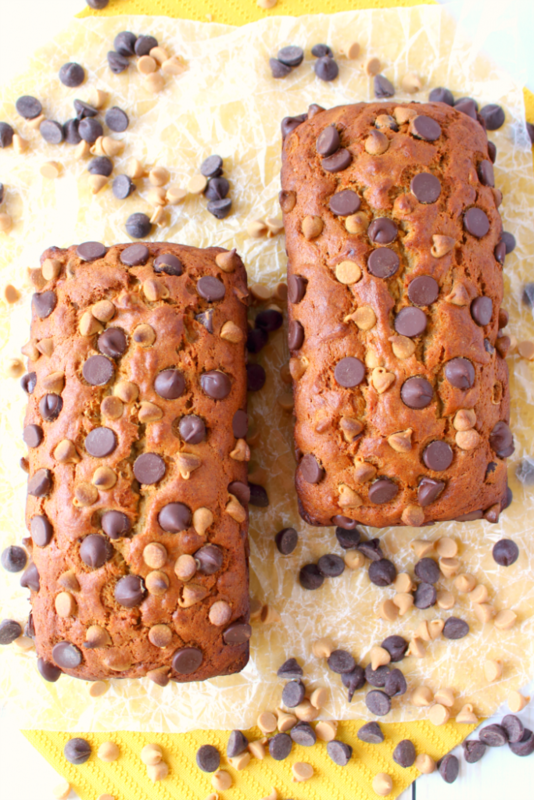 Peanut butter, chocolate chips all coming together in a moist banana bread makes for the most amazing treat! 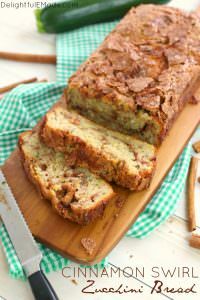 In coming up with this recipe, I basically just made a couple of adjustments to my go-to Award Winning Banana Bread recipe . I added a 1/2 cup of creamy peanut butter (you can also use chunky peanut butter if you prefer), and added 1 cup each of semi-sweet chocolate chips and peanut butter chips. 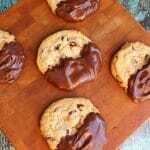 I absolutely LOVED the addition of the big chocolate and peanut butter chips in this recipe. It adds a nice texture component to the bread, and you really can’t beat the chocolate and peanut butter flavor combination! How many loaves does this chocolate chip bread recipe make? This recipe makes either one large loaf or two medium loaves. I actually prefer going with the two medium loaves. Sometimes when baking a large loaf in a 9 x 5″ pan I often times get overly browned edges, and an under-cooked middle. Dividing the batter between two medium 8 x 4″ pans helps alleviate this, as the bake time is typically reduced by about 7-10 minutes. I also have a mini-loaf pan that makes 4 mini loaves. 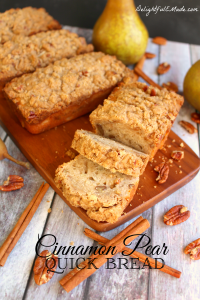 I’ve used this with my Cinnamon Pear Quick Bread, and could certainly be used with this recipe as well. For the mini loaves, test with a toothpick after about 30-35 minutes of baking. 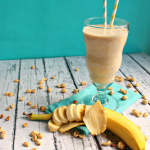 Perfect for a breakfast treat or afternoon snack! 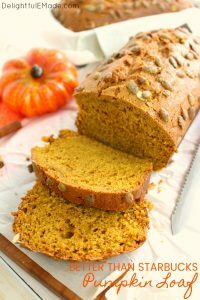 After the bread had cooled, slice into these loaves for an amazing breakfast snack or afternoon treat. 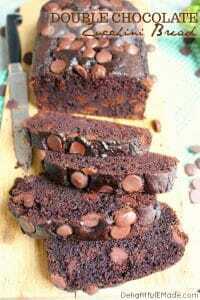 You’ll discover the big chocolate chips and delicious chunks of peanut butter chips in the middle of the loaf. This bread is awesome stashed away in kids lunchboxes, and is great to come home to for an after-school snack, as well! Keep one loaf, and give one to a friend! 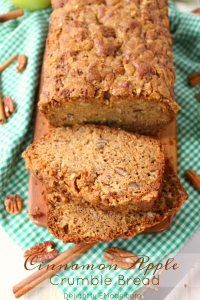 Your new favorite banana bread recipe is here! 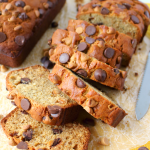 This flavorful, delicious banana bread is loaded with chocolate chips, creamy peanut butter, and peanut butter chips, making an amazing breakfast treat or afternoon snack. 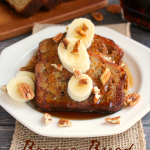 Starbucks banana loaf has got nothin' on this! Preheat oven to 350 degrees. Line the bottom of one 9" x 5" loaf pan (or two 8" x 4" pans) with waxed paper, and spray with non-stick baking spray. Set aside. In a large mixing bowl, stir together the mashed bananas, oil, sugar, eggs, and creamy peanut butter until smooth. 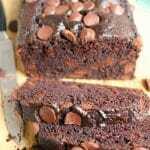 You can use a hand or stand mixer for this as well. In a separate bowl, whisk together the flour, baking powder, baking soda, and salt. Gradually add the dry ingredients to the wet ingredients. Stir in 3/4 each of the chocolate chips and peanut butter chips, reserving 1/4 cup of each for the topping. Pour the batter into the loaf pan(s). Top with the reserved chocolate and peanut butter chips. Bake at 350 degrees for 50-55 minutes for the 9" x 5" pan. For the smaller 8" x 4" pans, bake for 40-45 minutes, or when toothpick inserted comes out clean and crumb-free. Remove the bread from the oven and let cool completely. Once the bread is cool, run a knife around the edges of the pan, and invert. Remove the bottom piece of waxed paper. Oh my this looksThanks for sharing on the What's for Dinner link up!! so good!! I have some bananas I need to use! 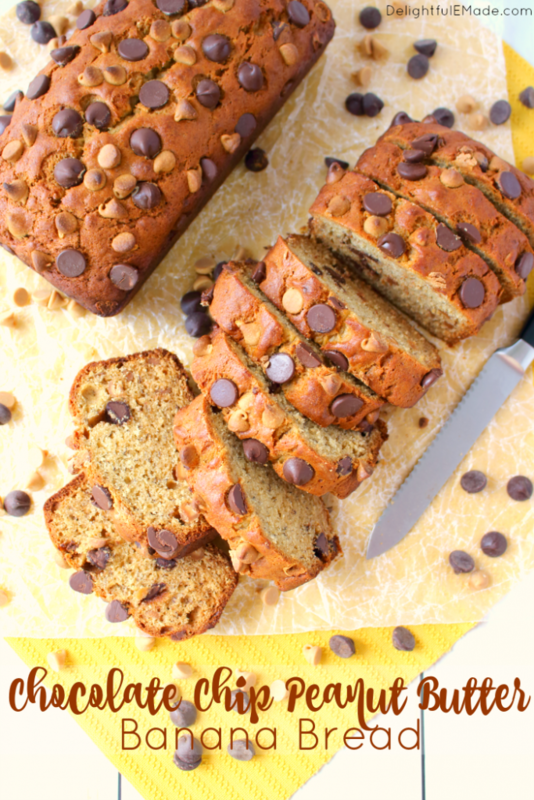 We are huge banana bread fans in this house (my 2 year old can live off of it if I gave her an option), and like you, I never thought to add any other flavors (other than chocolate chips) to my recipe. Thanks to you, I'll be trying it with peanut butter for sure. Thanks so much for sharing this awesome idea with us on #shinebloghop this week! 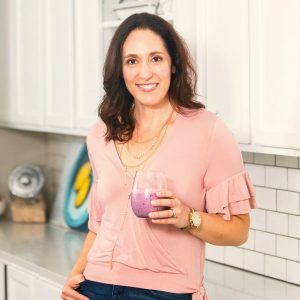 Happy to have you join us! Yum! Thanks for sharing with us at Throwback Thursday. Pinned and shared!